Even with bitcoin prices surging in recent days, not everyone in the cryptocurrency industry is focusing solely on the success of its most popular digital currency. HolyTransaction is a new cryptocurrency company that wants to be the market leader in the often speculative world of alternative digital currencies, and believes it stands to make big gains in the market by doing so. During a recent investor event at Plug and Play, Andrey Zamovskiy, CEO of HolyTransaction, told an audience the altcoin market is worth $30bn today by transaction volume, and that this number could be as high as $90bn by 2016. To reach this market, HolyTransaction has built a wallet that allows users to exchange various altcoins in one place. But the company insists that it is not an exchange in the traditional way. Holy Transaction promotes an ethos of being the easiest way to store, and convert, a variety of altcoins. However, the road to this realization was not an easy one for Zamovskiy. His first commercial bitcoin product came in 2011. Called BitMerch, it allowed businesses to accept BTC on websites. Zamovskiy is from Ukraine, so most of his customer base for BitMerch was in Europe. And while he was able to sign up over 1,000 customers for BitMerch, the amount of bitcoin sales was very low. It quickly became clear to the entrepreneur that people were not spending bitcoin – because they didn’t even know what it was. Armed with this information, Zamovskiy attempted to start another business in Ukraine that would get people to buy bitcoin with credit cards, but even that presented a number of problems. One was that the Ukrainian payment processor declined most international credit cards. Another was that obtaining bitcoin via cards presented a number of fraud issues – stolen cards could be used to obtain bitcoin, and then be fairly hard to track down. It was made clear, due to these issues and others, that another business idea would be required. Zamovskiy realized he would need to move to America in order to grow a cryptocurrency business. After some more trial and error, he eventually started HolyTransaction and was accepted as a startup at the Plug and Play Accelerator in Sunnyvale, CA. 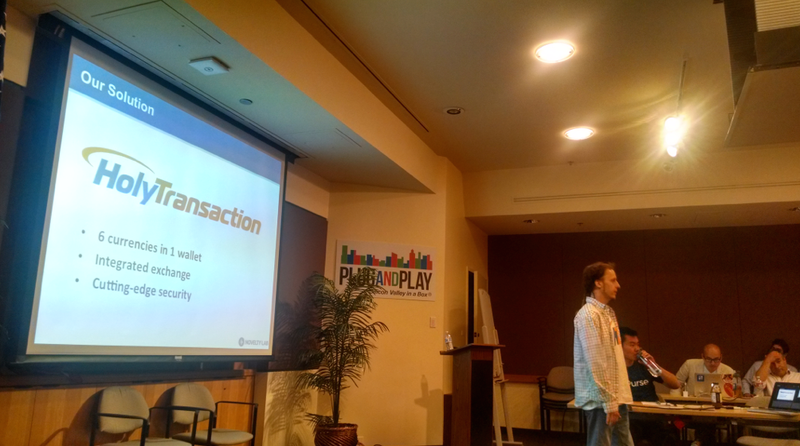 CEO Zamovskiy pitching HolyTransaction at Plug and Play to investors. 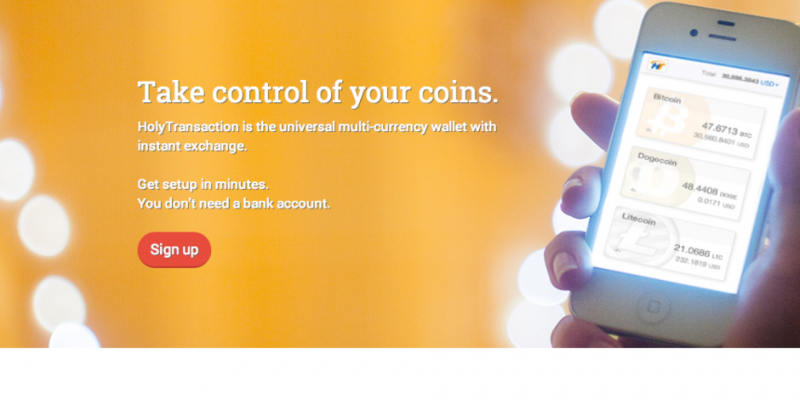 HolyTransaction currently makes money by charging its users 1% each time coins are exchanged within its wallet, and it plans to grow revenue as the altcoin market expands. According to Coinmarketcap, there are currently 37 cryptocurrencies that have a market capitalization of more than $1m. 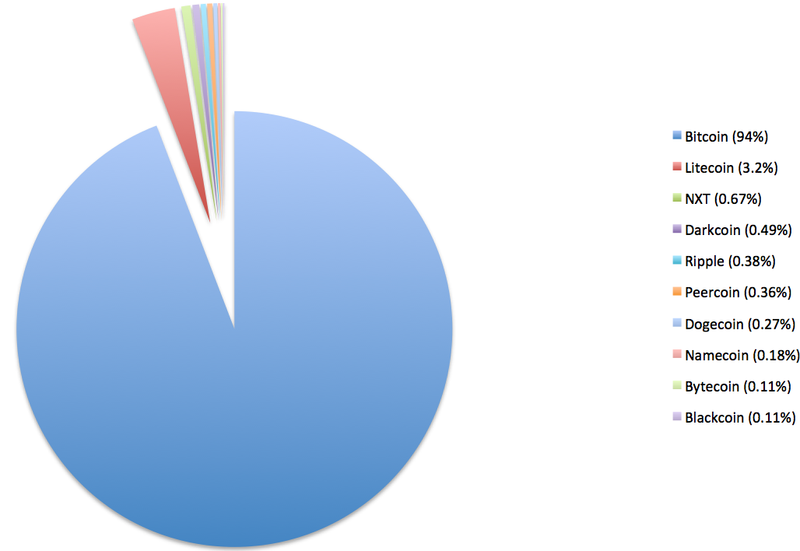 To make decisions on what coins to include in its wallet, Holy Transactions relies on feedback from its userbase. The startup also monitors a site called CoinGecko, which measures market cap, social media shares, developer repository activity and other metrics to give coins a ranking score. A lack of wallets can hurt an otherwise worthwhile coin, according to Zamovskiy. He pointed to namecoin and NXT in particular as alternative cryptocurrencies that struggle because of a lack of wallet choices. “NXT, for example, only has a client wallet. There’s no hosted wallet,” said Zamovskiy. HolyTransaction wants to be known as a trusted wallet partner within the cryptocurrency community. Instead of having to trust a shifting market flooded with coin (and wallet) options, investors can use the HolyTransaction platform to maintain safe storage, moving value in and out as needed. The altcoin market is almost always wavering on the whims of a brand-new coin reaching some new, lofty status, which often pushes some older coin down the ladder. Auroracoin is a notable example – there was a lot of hype surrounding this Icelandic-originated coin earlier this year, only for its price and subsequent interest to drop significantly. Because of this, HolyTransaction will have to remain vigilant about keeping the most relevant coins part of its wallet. Right now, the company has six coins in its hosted wallet – bitcoin, blackcoin, dogecoin, darkcoin, litecoin and peercoin, and four more are to be added at some point in the future. Through Zamovskiy’s knowledge of the intricacies of regulation, HolyTransaction has been able to land a partnership with Interac in compliance-friendly Canada, a feat also recently achieved by California-based expresscoin. The company has also completed its time at the Plug and Play incubator, and will set up its headquarters in the Bay Area, while maintaining an engineering office in Ukraine. From this new location, HolyTransaction will provide a service it believes people need, because investors will continue to place faith (and money) behind alternative cryptocurrencies. Developers will keep making them, and money will flow into these coins.